The holidays are almost over, and it is time to start lightening up our diets. That means no more artichoke dips or mini hot dogs, or cookies in place of breakfast. No more substituting our required 8 glasses of water with egg nog and hot chocolate. And please, no more Costco frozen appetizers! It’s time to start eating lighter and healthier. I know for a fact that almost everyone has made it their New Year’s resolution to loose weight, or at least start eating right (history tends to repeat itself)! But, we also all know that this is much easier said then done (again, history tends to repeat itself!). It is not surprising that so many people abandon their resolutions before the years end, considering just how challenging it is to find recipes that are healthy and yet still tasty. They do exist, but they are often tricky to find. Thankfully, this year you have my blog to help you locate them! 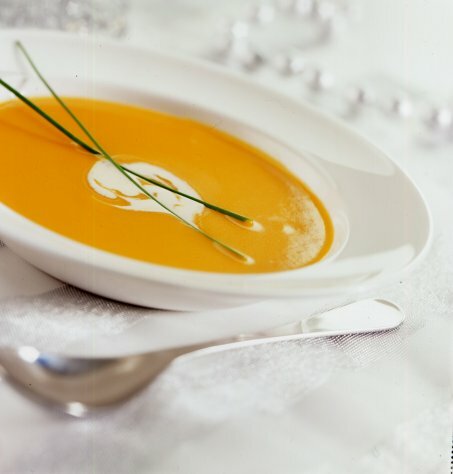 This recipe for roasted butternut squash soup is hearty, full of flavor, and best of all, naturally low in calories!! It will help you achieve your resolution without forcing you to sacrifice delicious food. This soup tastes so hearty and feels so satisfying largely because of it’s creamy consistency. There isn’t a ton of milk or cream in it, but the pureed butternut squash is thick and gives the impression of a cream base. In fact, I oftentimes forgo even adding any milk or cream to the soup, and find that the texture is not compromised in the least bit (it also freezes better without the dairy). Flavor wise, the soup has a perfect balance of sweet and spicy with the heat coming from the ginger and cayenne pepper and the sweetness coming from the butternut squash. To add another dimension to the soup, I like to serve mine with croutons on top or a side of fontina cheese crostini; it adds some crunch and breaks up the monotony of the puree. Overall, this soup is fabulous, simple to make, and I highly recommend it! Preheat oven to 350. Cut butternut squash in half lengthwise and rub with oil. Roast in oven on lined baking sheet for about 40-45 minutes, or until fork goes through squash easily. Once squash is cooked, heat butter and oil in a large stock pot over medium flame. Once hot, saute onion, leek, garlic, and ginger. Season with salt, pepper, and add cayenne pepper. Add chicken stock. Scoop out seeds from butternut squash and add the pulp into broth. Simmer on low for another 20-30 minutes, covered. Then with immersion blender or regular blender, puree soup. Return to pot and add milk, stirring. Bring to a low simmer for a minute or two. Adjust salt and pepper to taste. Serve in warm bowls with drizzle of cream, if desired.